Here’s a mystery for you: How can one recognize a sound if one doesn’t know what one is listening for? Envision the sound of water dripping. To us, it’s immediately identifiable. A persistent plunk of droplets, often landing in unwanted places. That faucet with the worn valve, a pipe’s joinery weakening, even raindrops plopping a steady rhythm – all instantly recognizable, regardless of different circumstances. It’s water. We know that. Now imagine that sound broadcast over light-years’ worth of distances. A resident of another galaxy hears it. Perhaps on his or her planet, water evaporates or freezes. Will this off-world listener misinterpret our ambient noises to be a distinct language? As depicted in the movie, “Contact,” our broadcasts words, laughter, music, applause and other activity drifted out beyond our solar system’s outer reaches. We only know what passes for language here on Earth. How do other life forms communicate? Perhaps applause might not be recognized as having a function. Music might not exist at all. Laughing might be a language all unto itself. We allege that our off-world companions might exhibit the same traits as we humans do. It’s only natural, since we don’t have any standard method of comparison. Our Earth is filled with a virtual cacophony of sounds, each bearing a unique interpretation, all providing information we need to assess our reaction, if any is necessary. How, then, do we describe to our off-world friend what exactly we are hearing when we cannot communicate the definition of it? What happens when we hear our first off-world sounds from a habited planet? A friendly gesture might resemble explosions. Our experience tells us we are in danger. Our foreign friend freaks out when charged with guns and bombs, and then what? The Off-Worlder retreats or worse, dies. 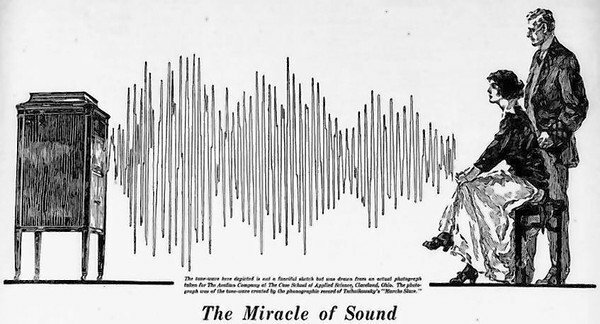 Sound waves travel differently given the amount of resistance they encounter. A bell changes its tune as it rises in altitude. Temperature also affects sound. String instruments hate the cold. Drums can be cooperative, although animal skin drumheads shrink or expand with the temperature and humidity. An off-world sound brought to Earth can lose its characteristics unique to its planet and present an entirely changed audio experience. How to identify a sound never before heard? Good question. I thought about that and wondered how I’d react. I’m curious and I’d investigate. I’d do that, though, only if the sound registers in my ear. If my cat ran off or the neighbor’s dogs started barking like crazy, and nothing was around to set them off, then what? Or if that sound destroyed object like a laser – a highly concentrated,focused beam of sound silently destroyed selected targets, I’d seriously worry.